The 2017 Winter Fayre will take place on Saturday the 18th of November at the BISH campus in Katy (2203 Westgreen, TX 77449). It will feature a range of fun stalls and activities as well as food, entertainment, music, Santa’s grotto and a Holiday Market featuring a range of outside vendors offering a diverse selection of products and services. The presence of outside vendors at the Holiday Market of the BISH Winter Fayre, has been a major contributing factor to the success of this annual event. 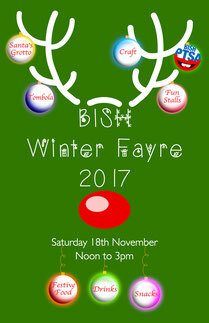 If you’re a vendor and would like to share in that success by having a stall at the BISH 2017 Winter Fayre then please click on the link below to complete and submit the application form. Note, we cannot accept applications for vendors selling foods for consumption at the fayre (other than candy).